To view this video, visit https://youtu.be/ZMFGYOwy74s. Anything that happens over time is a process. For example, tying your shoes is a process. So is painting a picture. So is putting on a play. 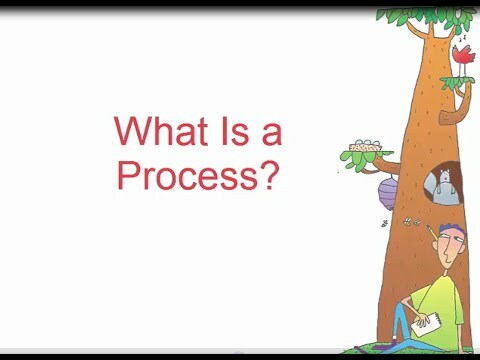 Watch this video to find out more about processes. Your Turn Think about processes. Answer each question below to think of processes that you know how to do. What do you know how to make? List the steps. How do you get ready for school in the morning? List the steps. How do you clean your room? List the steps. How do you walk from where you live to someplace special? Give directions. Thinking About a Process by Thoughtful Learning is licensed under a Creative Commons Attribution-NonCommercial-ShareAlike 4.0 International License. Based on a work at k12.thoughtfullearning.com/minilesson/thinking-about-process.